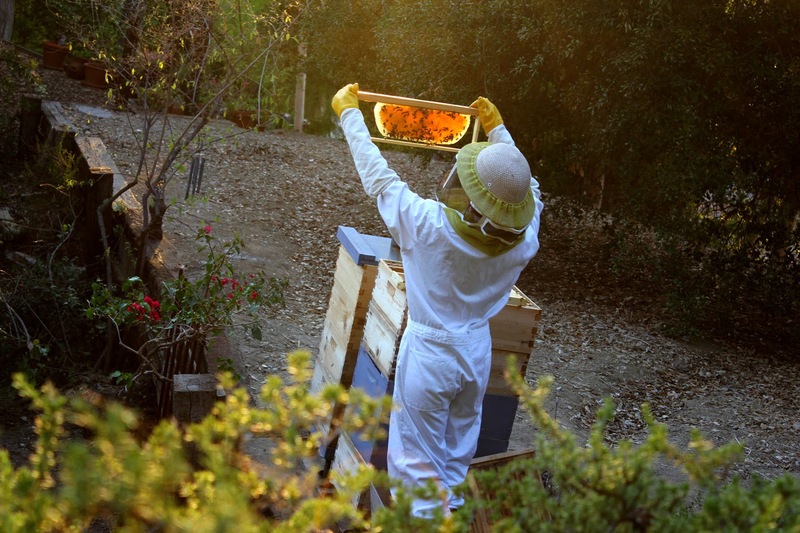 Yesterday morning, in downtown Los Angeles, the City Council approved a study to be done to approve urban beekeeping. This monumental event was in most part done by the efforts of Rob and Chelsea MacFarland of Honey Love. This comes on the heels of seventeen councils within the city of LA voting in favor of urban beekeeping. The bees found Rob one afternoon working and his garden and clearly choose to swarm there knowing they had found their hero. Three years later, after becoming part of the Backwards Beekeepers and creating Honey Love, Rob and Chelsea have managed to get the somewhat uptight and conventional members of the LA City Council to approve a measure to study the affects of urban beekeeping by the Planning Department. Our first hive arrived here in May of 2010. Since then it's been a continual, magnificent learning curve as we become educated on how to support these tiny beings. The anthroposophic movement seems to be the furtherest ahead in holistic beekeeping work out in the world right now. Here's a video of the Sun Hive (“Weissenseifener Haengekorb”) designed by the German sculptor Guenther Mancke. How I would love to attend that workshop and replace our Langstrom hives with a handmade, rye straw.